Two Emory hospitals rang in the New Year with new bundles of joy. 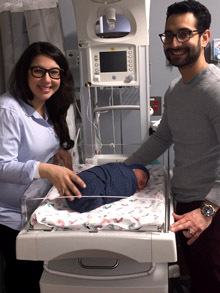 Emory University Hospital Midtown welcomed its first baby of the New Year at the stroke of midnight -- exactly 12:00:00 a.m. Emory Johns Creek Hospital's first baby of 2018 arrived at 4:18 a.m.
At Emory University Hospital Midtown, baby boy Luca weighed 6 pounds, 11 ounces. Mom Jillian and dad Antonio said he was due on Dec. 29, but was a little late arriving. They had no idea he would be a New Year's baby. "We were making good progress with the baby, and around 11 p.m. things started to pick up," says Jillian. "As we got closer and closer to midnight, we did a countdown to the New Year, did one last push, and the baby arrived right at midnight. It was like a movie in the making. The hospital staff and the support were amazing." 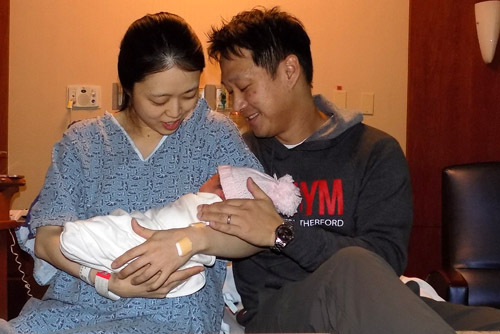 At Emory Johns Creek Hospital, baby girl Stella arrived at 4:18 a.m. on New Year's Day. She weighed 7 pounds, 2 ounces. Mom Grace says Stella was almost two weeks early. "When we showed up at the hospital much earlier than planned, we thought she would be a New Year's Eve baby, but she waited until New Year's Day to arrive," says Grace. "We are so excited." Both moms, both dads and both babies are doing well.